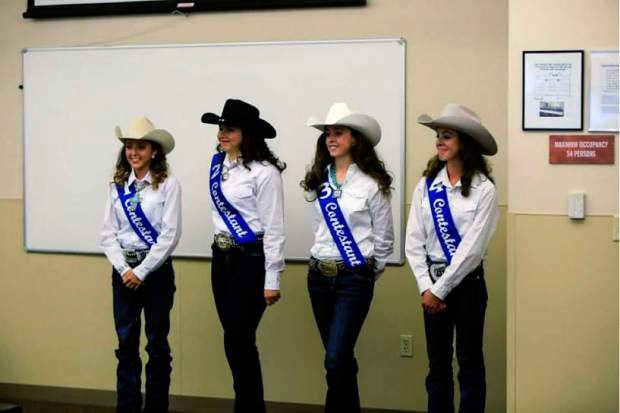 Laynie Kay and Lillie Parker are the only two related Larimer County Fair & Rodeo queens. The Royalty Program is 65 years old. As royalty, Laynie Kay Parker will receive a $2,000 scholarship at her reign’s end. Nearly every little girl dreams of being a princess. Laynie Kay Parker’s aspirations were higher. She wanted to be a queen. The 19-year-old Loveland, Colo., woman was surrounded by royalty on her way to the Larimer County Fair & Rodeo. Her AQHA-registered bay gelding is called Duke. Her now 23-year old sister, Lillie, served as Larimer Fair & Rodeo Queen several years ago. But unlike her Duke, Parker had to earn her crown, which she did in 2014. The trail to the throne was intense. She began riding around age 2, when her grandfather, Ed Wilkens, held her with him in the saddle. Her mother, Letricia, grew up herding cattle and freely riding around their Utah cattle ranch. Parker’s 21-year-old sister, Lyndie, is also an accomplished horsewoman. All three girls grew up owning horses and taking lessons with a trainer. Parker has ridden both English and Western in 4-H. She got Duke three years ago and competes with him in AQHA and RMQHA reining classes. Her other horse is registered as The Pepsi Kid. They call him Pepsi because he was bottle-raised from a 2-liter Pepsi bottle. In July 2014, Parker tried out for the Larimer County Fair & Rodeo Royalty program. Girls who will be ages 16-21 by the end of their reign and who own or lease a horse qualify. The process began with an application, which is used for a background check and screening by the royalty board and three judges. They look at grades, community and 4-H involvement and other criteria used to determine fitness for the position. Parker made it through this step. The next step in the royalty process is a meeting between the applicant and the Royalty Program Chairman. Then came the Larimer County Fair Parade, always held during the last week of July. At this event, competitors make their first appearance as contestants, riding horseback through a parade. They must be able to control their horses in stressful situations. Having a calm animal is a definite plus. When it was Parker’s turn to ride through, kids were blowing bubbles. Duke ended up sneezing soap after walking through the wall of glossy foam. The horse also had to endure jingling harnesses, screaming children, motorcycles and airborne candy. Three anonymous judges were in the crowd, watching Parker and Duke. Their job was to gauge how the royalty contestants interacted with the public and how their horses behaved. The same day as the parade, contestants were assigned a speech topic. They had one week to prepare and memorize their speech, which could be up to three minutes. Parker and her competitors each picked a U.S. founding father and explained what he did for the country. She picked John Jay. The next step of the process was a written test of about 30 questions. The test is used to determine contestants’ knowledge of the Professional Rodeo Cowboys Association’s rules and regulations, 4-H, equine knowledge, fair and royalty boards, the Larimer County commissioners and the U.S. president and vice president. After the test, the contestants gave their speeches. They couldn’t use note cards or any other prompts. Each had been assigned a number and appeared in that order. Next, each girl was presented with an impromptu and individualized question. For Parker, it was a political one. A mock media interview followed. A member of the royalty board quizzed each girl, asking her to introduce herself, state her goals, explain what goes on at Fair and what she sought to accomplish as royalty. “They want to see how you’ll do promoting the Fair and Rodeo to actual media and if you have the correct knowledge to do so,” Parker said. Then, there’s a one-on-three personal interview with the judging panel. It’s the only personal time spent with them, and without competitors or the public, which she said was nervewracking. For the next part of the event, the contestants led their ungroomed animals into the Budweiser Events Center Arena. A male family member traditionally serves as their assistant, carrying in grooming equipment and tack. Each girl then groomed her horse, saddled and warmed up, and then performed an identical reining pattern. Parker said she and each of her competitors had to ride straight to the judges afterward to answer equestrian questions. She then made a flag run to demonstrate how her horse accepted the flapping material streaming alongside him and how she could properly handle the flag. She concluded her performance with a queen’s wave. After each contestant led her horse to its trailer, they came back to the arena to await the judges’ decision on who was 1st Runner-Up and who was Queen of the Larimer County Fair & Rodeo for 2014-2016. The crowning ceremony always takes place at the Tuesday night rodeo. The coveted crown landed on Parker’s head. During her 2-year reign, Parker has attended a plethora of events, at which she has acted as ambassador for the sport of rodeo, 4-H and the Western way of life. Some of her stops have included the Larimer County Fair & Rodeo, Jefferson County Fair & Rodeo, National Western Stock Show, Cheyenne Frontier Days, sponsor events, parades and rodeos and more. At all events, royalty must wear specific attire designated by handbook guidelines. For example, her hair must be curled and she must wear a cowboy hat and crown, her banner, belt buckle and event-specific clothing. Parker’s reign will end at the 2016 Larimer County Fair & Rodeo. Her successor will serve as lady-in-waiting until the fair’s end. Working toward an associate’s in political science, Parker intends to pursue a career in some branch of the law but will always continue riding.